On November 1, 1944, the first of what would end up to be thousands of missions by the famous Boeing B-29 Superfortress flew over Tokyo, Japan on a reconnaissance mission, the first allied aircraft over Tokyo since the 1942 Doolittle Raid. The aircraft was a special photo-reconnaissance version of the big bomber, equipped with 3 powerful cameras. Unlike many other warplanes fitted for reconnaissance, the F-13 and F-13A versions of the B-29 retained their defensive guns and bombing equipment. 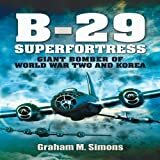 The 118 F-13 and F-13A Superfortresses were later re-designated RB-29 and RB-29A in 1948. Although military aircraft designed from the start to perform reconnaissance have been built, notably the Lockheed U-2 and Lockheed SR-71 Blackbird, fighter and bomber aircraft have often been adapted for this role by virtually all air forces through history. The British used unarmed Mosquito light bombers and Supermarine Spitfire fighters without guns to take photos of enemy positions in World War II, with the stripping off of armaments allowing the planes extra speed to avoid interception. The Germans flew perhaps the best recon aircraft of World War II, the Arado 234 jet powered bomber equipped with cameras instead of bombs, which flew so high and so fast the Allies often did not know they had been overflown! The US fielded the F-3 recon version of the Douglas A-20 Havoc attack plane in all theaters during World War II. America’s first jet bomber, the B-45 Tornado was converted to the RB-45C for recon duty during the Korean War. The United States Air Force, Navy and Marine Corps used recon versions of the remarkably versatile McDonnell Douglas F-4 Phantom II equipped with side looking imaging radar and FLIR as well as standard photographic equipment for many years, the speed of an F-4 in a “clean” configuration” without rockets, bombs, and guns allowing great speed. These RF-4B, C and D’s served from the 1960’s until 1996 with the US military. The US Navy also used recon versions of the A-5 Vigilante extensively in the 1960’s and 1970’s. In fact, this plane designed as a supersonic nuclear bomber, carrier borne, was so much better in the recon role that of the 156 Vigilantes built, 140 were RA-5C reconnaissance configured. The Boeing RB-47 recon variant of the first US nuclear strategic jet bomber served from the early 1950’s until 1969. The beautiful swept wing 6 jet engine powered bomber made a dandy recon platform, with daylight and nighttime cameras, radars, and electronic data gathering devices. These (240 of the RB-47E models along with other RB-47 types) were the only B-47 jets to see combat, often overflying Soviet territory resulting in a total of 3 of them being shot down by the Soviets. (From 1951 to 1959 when the B-52 became fully operational, the B-47 was the strategic nuclear bomber of the USAF.) Other notable American warplane to recon converted jet aircraft of the Cold War included the Martin RB-57 Canberra, the Douglas RB-66B Destroyer (the Navy version was the A-3 Sky Warrior), and the McDonnel RF-101A Voodoo. Many other fighter and bomber aircraft have also been used in the recon role by the US. With the retirement of the RF-4 and SR-71 in the US inventory, speculation about what dedicated reconnaissance aircraft have been secretly fielded to replace them is rampant. (We still use versions of the venerable U-2.) What we do know is that our current bomber and fighter aircraft have the performance and stealthiness to carry camera equipment in the recon role if needed, and probably do (although recon versions of the F-15 and F16 were shelved). No doubt the B-2 stealth bomber and F-22 Raptor stealth fighter would make great recon planes, and perhaps the F-35 family of multi-role fighters will be used this way at some point. Do you have a favorite warplane turned recon plane? If so, tell us your reasons. Previous ArticleOctober 31, 2016: Clowns! Too Creepy for Halloween! Next Article November 2, 2004: Islamic Terror Strikes The Netherlands, Gory, Gory, Gory!